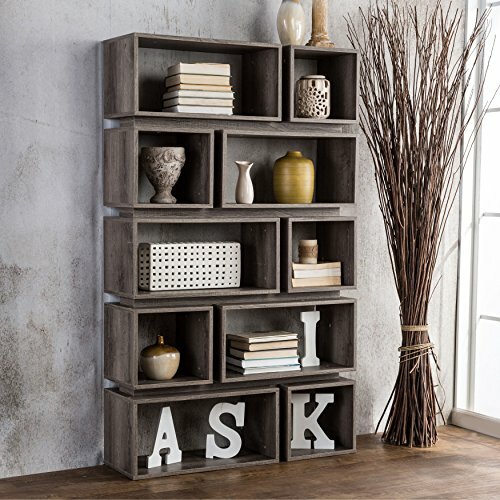 This undeniably chic bookcase offers multiple storage or display options for your office or living space. Tiered structure with ten (10) shelves of alternating sizes, Doubles as a bookshelf or room divider with open back design. Easily display memorabilia, photos, books and more, Ideal piece in any apartment, studio, office or living space. Large shelf dimensions: 10.75 high x 21.5 wide x 11.75 deep inches. Small shelf dimensions: 10.75 high x 13 wide x 11.75 deep inches. Assembly Required. Overall dimensions: 65.25 high x 39.25 wide x 11.75 deep. This undeniably chic bookcase offers multiple storage or display options for your office or living space. Assembly Required. Overall dimensions: 65.25 high x 39.25 wide x 11.75 deep. Bonus pen will be sent separately. If you have any questions about this product by ModHaus Living, contact us by completing and submitting the form below. If you are looking for a specif part number, please include it with your message.